Price is $9.00 a pound, sold in 2.5 pound bags. 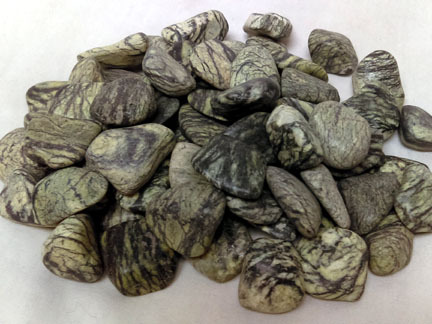 Serpentine stone comes in staggering variety of colors. The variations in color is the result of varied mineral infusions in the stone. The name has been derived from the color and appearances of the stone which resembles the skin of a serpent. Tumbled stone is available in two sizes. Order in 2.5 lb. increments.